Reading of correspondence from Scottish Terrier Club of Greater New York Rescue which notifies us of a generous donation in honor of our founder and former CEO, the Late Great Angus Fala, from Cheryl Fugate. Unanimous approval from our board of directors expressing appreciation to Cheryl Fugate for her generosity, and the New York Scottie Rescue for the wonderful work they do. Meeting Adjourned, next meeting scheduled for Friday, August 21, 2015, in Toledo, Ohio. 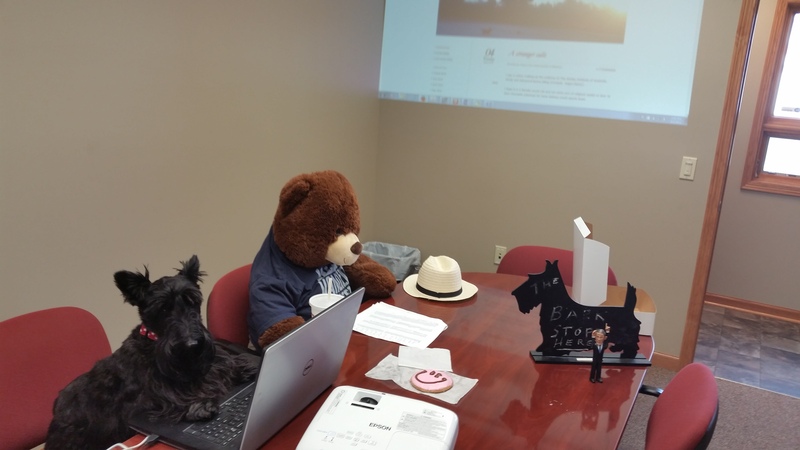 So nice to see how respectful Mr.Bear is with leaving his hat on the desk. Ms Fugate is most generous in respecting Angus memory. We think you should encourage your respectful followers it is awesome if they enlarge your photos to full screen. Hey you guys, you’re not acting like a real corporation until you vote yourself a raise at every meeting. oh, we do that in executive session. We only publish those minutes really late on a Friday night months after the fact. No need to do that. Only lawmakers have to resort to such trickery. We think Ainsley wants the cookie, the expression on her face is priceless. Is there are surplus of bunnies in Toledo, necessitating a special visit? A very productive meeting Captain McKenna. Please remember me for any future endeauvers in reducing the bunny population. I come with raving references and high recommendations. Respectively, Max Snyder Esq.